RANCHO CORDOVA, Calif., April 11, 2018 –VSP Optics announced today the expansion of the Unity Via lens portfolio with the introduction of Unity Via OfficePro. 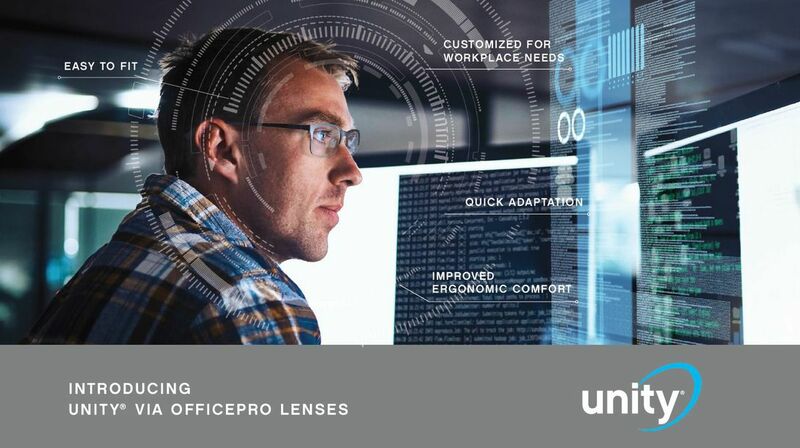 Optimized for the everyday office work environment, Unity Via OfficePro utilizes the same advanced technology at the core of Unity Via Progressive Lenses— offering a lens that is easy to fit, customize, and dispense, and provides effortless vision in the workplace. Unity Via OfficePro automatically calculates the near and intermediate zones. It’s available in two working distances, 5-feet and 10-feet to meet every patient’s needs. “We’ve taken the same technology that patients and doctors have come to love about Unity Via Progressive Lenses, and put it into a task-oriented lens that benefits eye care professionals and patients alike,” said Randy Dannewitz, senior vice president of strategic development for VSP Optics. The lens design features maximized intermediate and near zones, making Unity Via OfficePro the ideal choice for activities like computer work, reading, writing, and meetings. In addition to improved visual performance, it also helps alleviate eye strain, improves ergonomic comfort, improves clarity on digital displays, and offers ultra-fast adaptation for wearers. Unity Via OfficePro is now available to order. Learn more at: www.unitylenses.com. VSP Global® is a doctor-governed company that exists to create value for members and opportunities for VSP network doctors. Our industry leading businesses include VSP® Vision Care, the only national not-for-profit vision benefits company, which provides access to eye care for 88 million members through a network of 39,000 eye doctors worldwide; Marchon® Eyewear, Inc., one of the world’s largest designers, manufacturers and distributors of high quality eyewear and sunwear; VSP Optics, industry leaders in ophthalmic technology and lab services, providing custom lens solutions for the vision and lifestyle needs of patients; Eyefinity®, the industry leader in practice management and electronic health record software, and VSP Retail, which focuses on increasing access to eye care and eyewear through multiple channels. Together with VSP network doctors, VSP Global's Eyes of Hope® has provided access to no-cost eye care and eyewear for more than 1.8 million people in need.